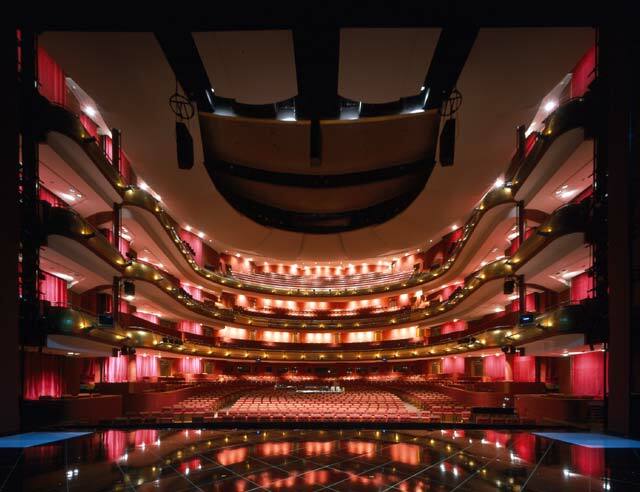 Singapore: A performing arts complex 30 years in the making puts a strictly-business city on the international cultural map. Is there an arts complex anywhere in the world that hasn�t generated political, economic, cultural, and aesthetic controversies? 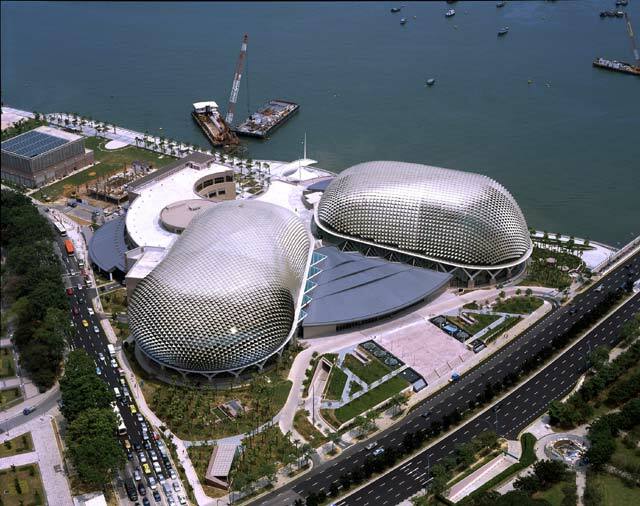 The newest is Singapore�s Esplanade - Theatres on the Bay. 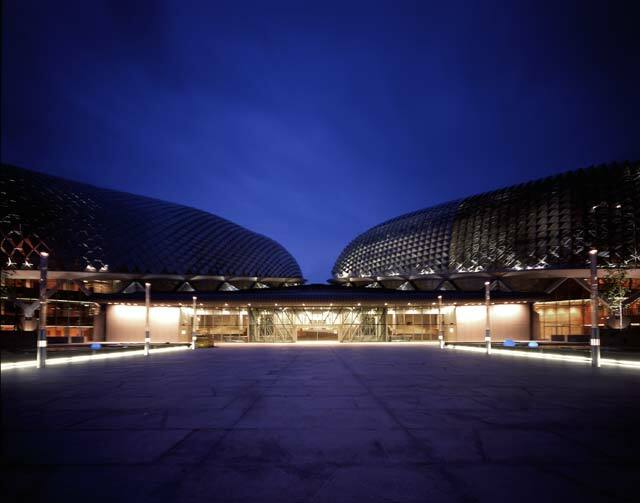 Nearly 30 years after the idea of a national arts center for Singapore was first conceived, and 12 years since the Steering Committee that guided its birth was formed, the Esplanade formally opened on October 12, 2002, (The government even issued commemorative stamps to mark the occasion. Since gaining independence in 1965, Singapore has become an economic dynamo, and a local truism says there are five �C�s� to happiness: car, cash, condo, credit card, and country club. The Esplanade is the government�s impressive step to add a sixth �C� � �culture� � to the mix. 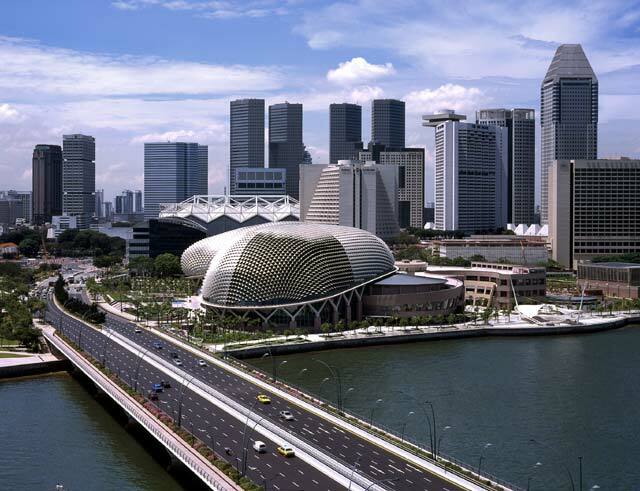 The complex sits on six hectares (almost 15 acres) of prime waterfront land on Marina Bay, and is primed, both architecturally and technically, to put Singapore on the international cultural map. There was no doubt that the performance venues had to meet the highest of standards for the Esplanade to attract world-class performers. To that end, the project was designed from the inside out. In 1990, the London office of Theatre Projects Consultants (TPC) was among the first on an international team, writing both the theater and the architectural brief, and assisting in the selection of architects. Also brought on board early was acoustics specialist Artec Consultants. The architectural controversy began in 1991 with questions about why such an important project was not an open international competition. London-based James Stirling Michael Wilford & Associates and DP Architects of Singapore won out over three other short-listed teams from a field of 48 architects invited to pre-qualify for the design stage of the competition. Stirling died in June 1992. The re-named Michael Wilford & Partners (MWP) and DP Architects (DPA) designed the competition entry, and were named the winning team in December 1992. The final design was completed in 1995, at the same time the Ministry of Information and the Arts decided to make it a two-phase project. At that point, for logistical and/or political exigencies (depending on which official or rumoured reports one reads), MWP handed the reins to DPA to complete the first phase. 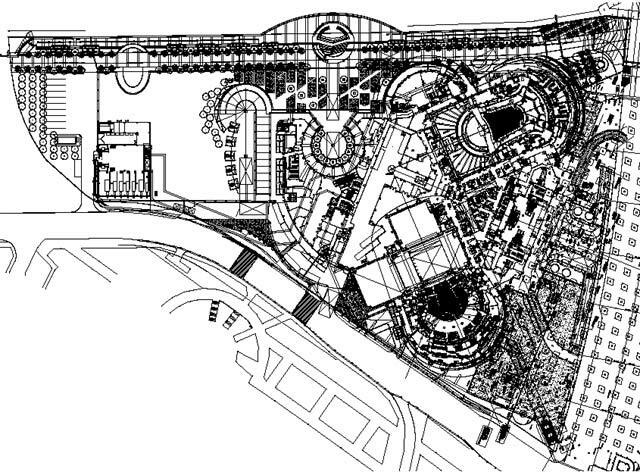 The original plans called for five major performance spaces. The SGD$600-million first phase includes the 2,000-seat Lyric Theatre and the 1,800-seat Concert Hall, in addition to a 250-seat recital studio, and 220-seat theater studio, plus outdoor performance spaces, private functions rooms, dining, and (of course) a shopping mall. 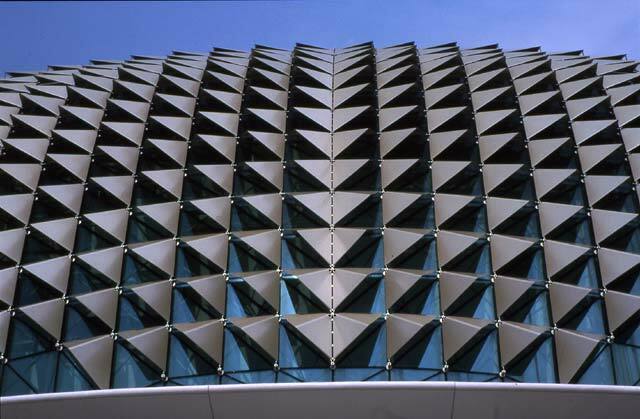 Because the sun�s position and movement is constant year round, the architects devised a fixed cladding system consisting of a glazed steel space frame with triangular aluminum sun shields. 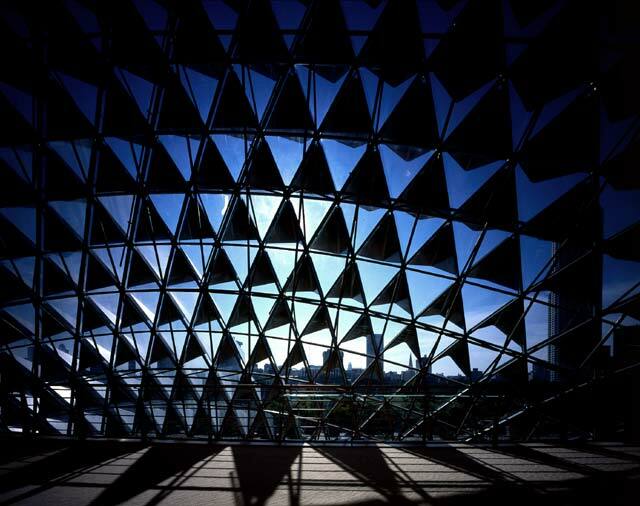 The shields are set to be more open or closed, depending on the angle the sun hits them, so the glass facades are protected from direct sunlight without limiting the views. 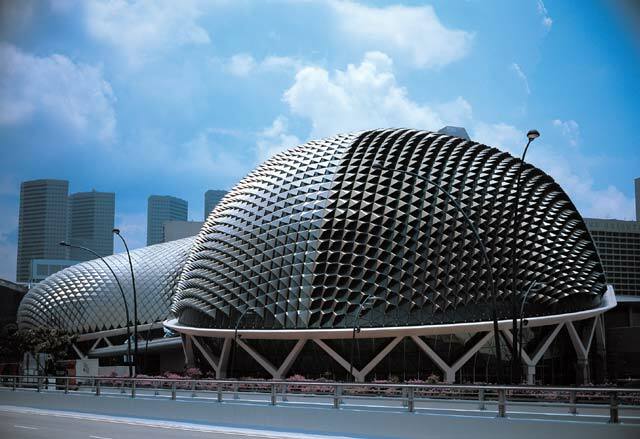 This textured sunshade skin has given rise to a number of endearing (and not-so-endearing) nicknames for the complex, such as �petals,� �fish scales,� and �bug�s eyes.� Singaporeans (also known as �heartlanders�) have seemed to settle on calling it �the durian� � a sweet local fruit known for its prickly skin and noxious smell. Surrounded by the high-rise buildings of Singapore city, including the 70-story Swiss�tel (The Stamford), Esplanade is also designed to be viewed from above. �For example, the fly tower of a theater is usually hidden from view, surrounded by buildings. 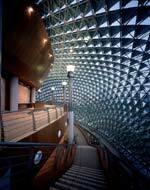 In Esplanade, it had to be an integral part of the design�, explained Wilford. There is also no �back door.� The location, on Marina Bay between the historic/civic districts and the modern city, gives the building three main public edges. Wilford describes it as a building with �three fronts and no backs.� The typical back doors of a theater, such as the loading dock, are part of one of the frontages. Staples and his team spent considerable time studying and understanding the needs of the eastern arts, such as Chinese opera, Indian music and dance, and Indonesian and Malay performance. While the venues are still pretty much Western in design, there are characteristics peculiar to Asia. The greatest difference between the two is that the East has no tradition of indoor theater. �Eastern performance art almost always takes place outside,� Staples explains. �The opening festival featured some 600 free outdoor performances.� Two main outdoor venues were incorporated into the design. The Outdoor Theatre, which sits on the 300-meter-long waterfront along Marina Bay, and The Edge, most suited for medium to large-scale performances. There is also plenty of opportunity for people to meet, eat, drink and be entertained outdoors, including the open air Courtyard at Esplanade Mall. Internal venues also had to reflect Asian performance. Asian music is also different � louder and more percussive. 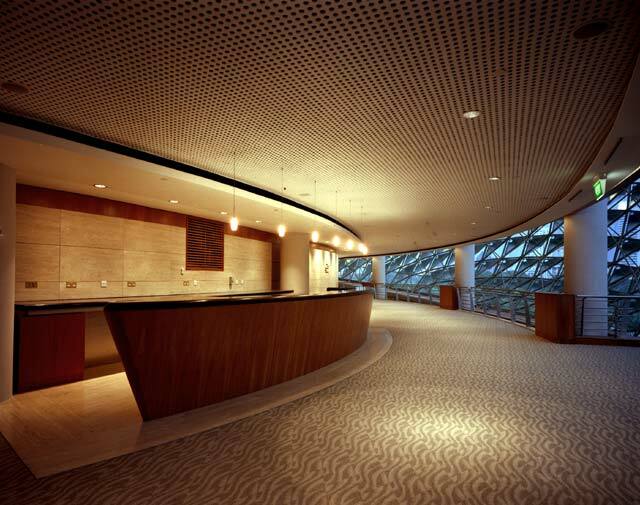 TPC and Artec Consultants developed three main devices in the Concert Hall to create some of the most flexible acoustics in the world. 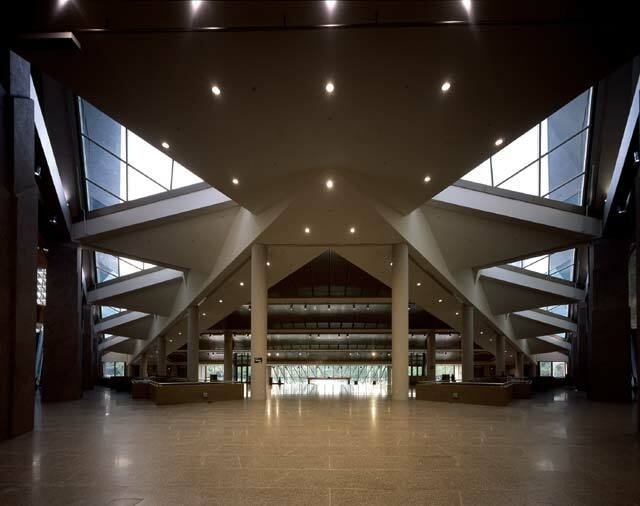 The hall is connected to huge reverberation chambers by 58 concrete doors that can be partially or fully opened in different configurations. These, together with 1,000 square meters of acoustic banners, allow the hall to be fine tuned, even from one piece of music to the next. Finally, over the concert platform are three acoustic canopies that can be raised or lowered as required, and which are especially important in helping musicians on stage hear each other. 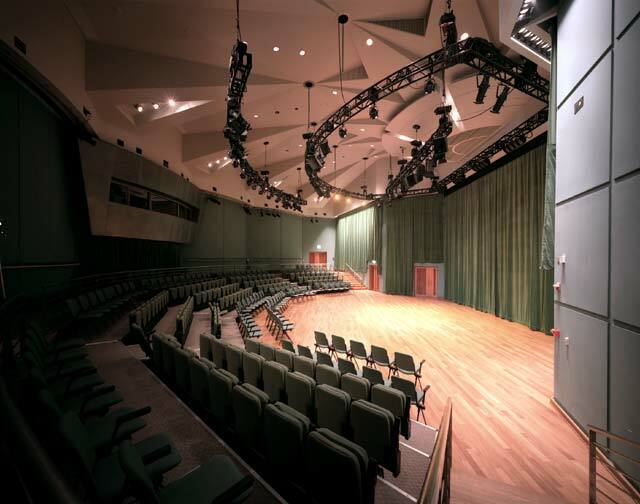 The acoustic chambers give the Concert Hall the form of a box-within-a-box (the reverberation chambers actually double the volume of the hall). 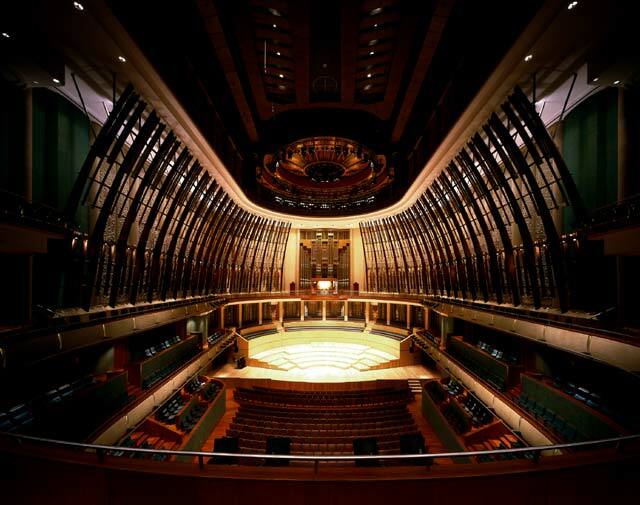 The Lyric Theatre has the horseshoe shape of classic European opera houses with four galleries and the largest performing stage in Singapore. This accommodates Chinese opera and Indian dance, for example, where the musicians are on stage with the performers, unlike western culture, where the orchestra is hidden in a pit. 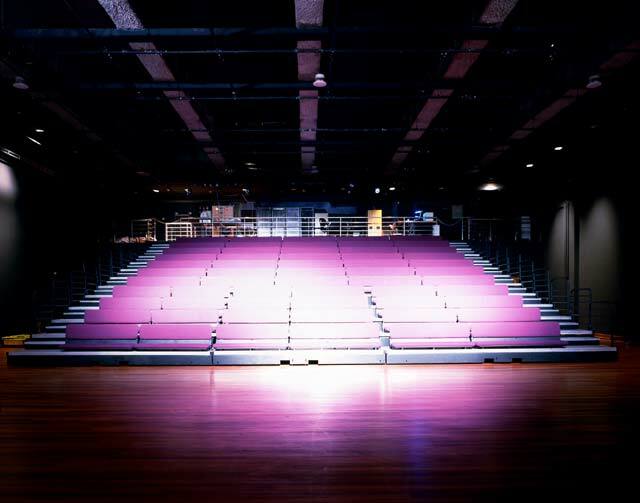 The theater�s proscenium width, adjustable from 14 to 16.5 meters, is a good two meters wider than is usual in the west. Flexible acoustics were important here as well. For speech and amplified music events, a series of acoustic banners can be lowered into the room to reduce the reverberation time. Both theaters sit on rubber footings to isolate them from the vibrations of nearby subway lines. Having overseen the commissioning of the equipment and arranged the handover to the client, Theatre Projects Consultants will continue to monitor both the project and the equipment for the next two years. 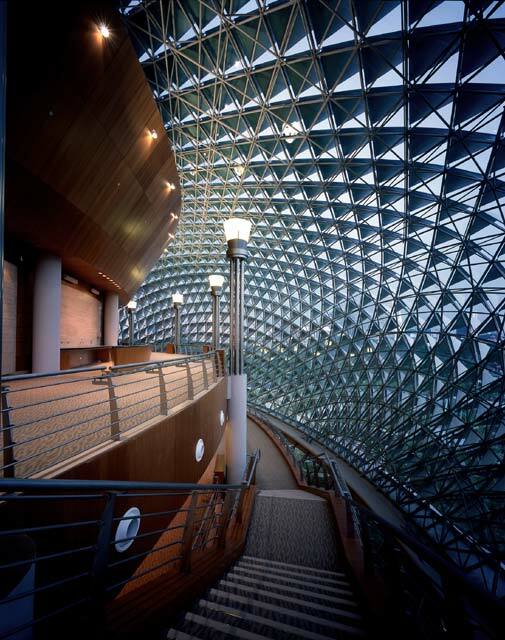 The Esplanade has already won the bid to host the 17th Congress for the International Society for the Performing Arts in June 2003, the first time the Congress has been held in Asia � and the first time the Society has chosen a center prior to its opening. 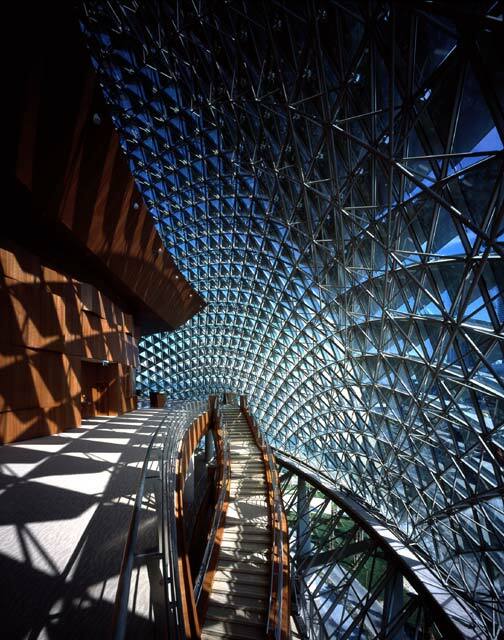 The complex also includes the 2,300-square-meter library@esplanade, the country�s first �themed� library devoted to music, dance, theater, and film. The Esplanade�s mission statement says: �To entertain, engage, educate and inspire.� A two-day open house prior to the official opening attracted a reported 400,000 heartlanders � that�s about 10 percent of the entire population. Then followed a three-week opening festival that included 1,300 artists from 22 countries, performing in 70 different productions. Certainly the grand opening and the current calendar of international performerances bode auspicious beginnings. Client: Public Works Department and Singapore Arts Centre Company Ltd. In 1960, Michael Wilford joined the practice that James Stirling created in 1956. The Stirling/Wilford partnership was established in 1971 and continued until James Stirling's death in 1992. From 1993 to 2001 Michael Wilford worked in partnership under the name of Michael Wilford and Partners. In London, Michael Wilford is now working in collaboration with MUMA (McInnes, Usher, McKnight Architects), and in Germany has established Wilford Schupp, based in Stuttgart. Michael Wilford's work has gained international renown and includes significant public buildings such as performing art centers, art galleries, museums, and libraries around the world. These projects have won many architectural awards, the most recent being The Royal Fine Art Commission Building of the Year Award in 2001 for The Lowry performing and visual arts center in Salford, England. 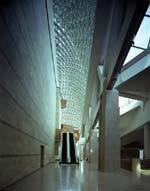 Wilford teaches extensively in schools of architecture in the U.K., U.S., Canada, and Australia. He is a member of the Royal Institute of British Architects, the Singapore Institute of Architects, Royal Institute of Arbitrators, Fellow of Royal Society of Arts, and an Honorary Member of Bund Deutsche Arkitecten. In 2001 he was made a Commander of the British Empire. DP Architects was incorporated in 1975 as a continuation of Design Partnership founded in 1967. In the last 30 years, the firm has established significant presence in Singapore with offices in Malaysia, Philippines, Hong Kong, Indonesia, and China. It is an award-winning firm offering a wide range of services from architecture and urban design/planning, to interior design, graphic design, and project management. In 1982, two subsidiary companies, DP Design and DP Consultants, were established. Clients include public and private companies, government and semi-government bodies, institutions, and private developers. Theatre Projects Consultants (TPC) was founded by Richard Pilbrow in 1957, and has offices in South Norwalk, Conn., London, Los Angeles, Toronto, and Singapore. Recent projects include the Kodak Theatre, Hollywood; Kimmel Center, Philadelphia; New Amsterdam Theatre renovation, New York City; New Goodman Theatre, Chicago; the Glyndebourne Opera House, Sussex, England; renovation work for the Kennedy Center, Washington, D.C.; performing arts centers in Dayton, Ohio; Madison, Wisconsin; Tempe, Arizona; and Dallas; the Esplanade Cultural Center, Singapore; the Walt Disney Concert Hall, Los Angeles; and new opera houses in Galicia, Spain, and Oslo, Norway. Artec Consultants Inc. was founded in 1970 by Russell Johnson. 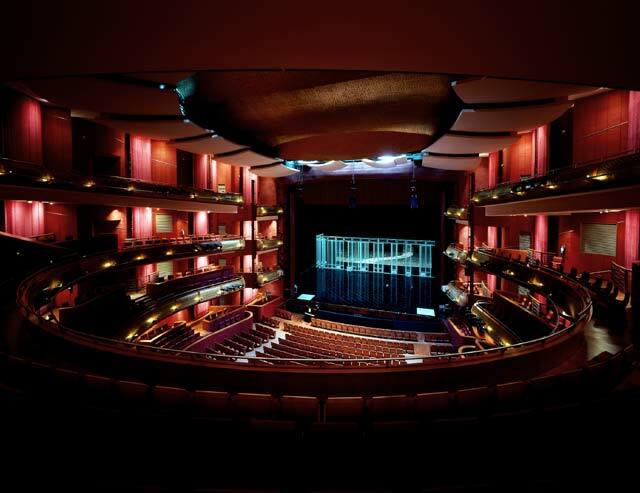 Some of the New York City-based firm�s most prestigious accomplishments include: Symphony Hall, Birmingham, UK; the Meyerson Symphony Center, Dallas; the Culture and Congress Centre, Lucerne, Switzerland; Sala Sao Paulo, Sao Paulo, Brazil; l�Auditorium, Dijon, France; and the Chan Centre for the Performing Arts, Vancouver, B. C. Facilities currently in design include an opera house and concert hall in Singapore; the renovation of the Roy Thomson Hall, Toronto; a concert hall in Costa Mesa, Calif.; and an opera house and concert hall in Miami. PWD Corporation and its subsidiary, PWD Consultants, was established in 1999 when the former Singapore Public Works Department was re-formed as a corporation. In July 2002, the firm changed its name to CPG Corporation Pte Ltd (signifying �creative professionals group�). Based in Singapore, it is one of Asia�s leading development and management firms with a staff of 2,000 in offices in People�s Republic of China, India, the Philippines, and the Middle East. Building and infrastructure development services include master planning, architectural and engineering design and consultancy, project management, design/build, facilities management, and diagnostic and quality assurance testing. 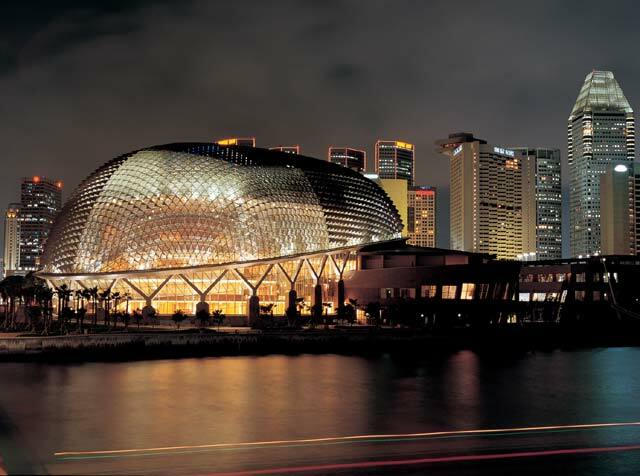 The Esplanade - Theatres on the Bay glows against the Singapore skyline. 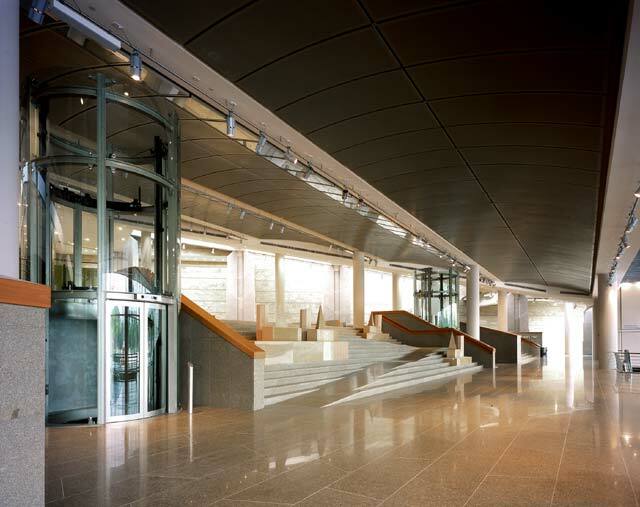 During the day, multi-level lobbies and foyers are flooded with natural light. The 2,000-seat Lyric Theatre is styled after classic, horseshoe-shaped European opera houses. The theater's flexible stage and acoustic ceiling banners allows for a multitude of performance arts. 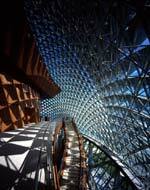 The focal point of the 1,800-seat Concert Hall is a magnificent Klais organ.